Mice and rats are one of the most common pests in the UK. Not only do brown rats carry numerous illness and parasites, but these rodents are capable of chewing through fittings and furniture. They can also gnaw on electrical cables causing significant repair costs, and the increased risk of fire. Luckily, rodents are easily dealt with, and it will cost around £95 to have four poison bait traps set. If you’re not unnerved by the potential of dealing with dead rats and mice yourself, you can buy your own rat poison for a cheaper solution. Squirrels are common in the UK’s towns and cities, and have become as much a nuisance as rats and mice. In fact, due to their tree-climbing dexterity, you might find they’re able to cause more damage. They will chew through external fittings like guttering, pipes, woodwork and insulation, but can also get into your loft where they can cause even more destruction. Like rats, they also carry diseases but they can be a lot more aggressive when challenged. This means you should hire a professional pest controller to deal with them. Two visits with baits and traps will cost around £75. You can also get contractors to install squirrel proofing for around £100 more. Moles might not be common in urban areas, but in rural locations they can cause devastation to gardens and recreational areas like parks and golf courses. If you’ve got a problem with moles in your garden there will be an enormous network of tunnels and dens beneath your lawn. Many poisons are now prohibited, so it’s best to hire a contractor who can place some traps. Depending on the number of mole hills you have, two treatments will cost in the region of between £70 and £90. Wasp and hornet nests can be dangerous around the home, increasing the risk you might get stung. Meanwhile, though bees are less aggressive, you certainly don’t want a swarm trying to build a home in your property’s eaves. If you’re in any doubt about which of these stinging insects you’ve got, it’s best to call in the professionals. For bees, the beekeeper association will have the contact details for local keepers who can come out and relocate the hive without hurting the insects. Meanwhile, for wasps and hornets, it’s important to hire contractors so you’re not hurt. On average, it will cost about £55 to have each nest sprayed and removed. Ants might not seem like a major problem, but when an infestation occurs and you start to get them marching around your house, it’s time to get rid of them. There are a lot of products available to reduce and kill ant nests, and you can start the culling process yourself. However, if the infestation continues, you can call in the professionals. A guaranteed six or eight week treatment will cost around £60. However, once you’ve got ants you’re unlikely to get rid of them entirely so it’s best to keep on top of them with DIY methods. Cockroaches are fairly common, especially in urban areas. Though they might seem like just another bug, they carry diseases so it’s important to get rid of them. Unfortunately, these insects make life difficult because they hide in walls, rubbish, furniture and ceiling voids, so it’s hard to access them. For this reason, it’s a good idea to have the problem dealt with professionally. For the average two or three-bed house, it will cost around £45 for a single treatment. Fleas can be a nuisance on your pets, but once the population gets out of control, they can be extremely hard to eradicate entirely. This is because most fleas don’t actually live on your dog or cat, but in the nooks, crannies and cracks of your home. Though you can buy flea sprays, it’s hard to cover an entire house efficiently. A guaranteed six or eight week spray from professional pest controllers will cost around £85 for a one-bed home, £95 for a two-bed property and £105 for a three-bed house. Bedbugs are extremely hard to eliminate entirely because they’re tiny. When you’re asleep, they’re coaxed out of hiding by body heat and CO2 from breathing, and will then feast on your blood. If you have bedbugs, it’s essential to get in pest control. You’ll need at least three spray treatments which will cost £135, £175 and £205 for a one-bed, two-bed and three-bed property respectively. The pest control costs given are basic rates that may increase depending on your circumstances. For example, the scale of an infestation will affect how many treatments are required, whilst there are regional differences, with prices higher in London. If you’re not using your local council, you should get at least three quotes from contractors before giving the green light to ensure you’re pest free and financially happy. 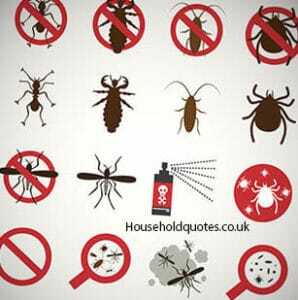 Get FREE Pest Control Quotes Today!